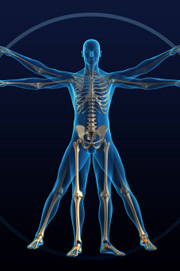 Musculoskeletal pain syndromes are caused by damage to the soft tissue including tendons, ligaments, discs and muscles. In addition, arthritis, also known as degeneration of the joints in the spine and extra spinal areas (hips, knees, elbow, etc.) contributes to pain and dysfunction. Nerves entrapped by discs, arthritis, and muscles may cause exquisite pain, tingling and numbness in the arms and legs. Hands on care, including chiropractic, massage therapy, and acupuncture can help relieve pain and promote function by promoting blood flow through damaged areas, decreasing inflammation and pain, restoring joint motion, and freeing tendons, ligaments and muscles of scar tissue and active trigger points. Tension and migraine headaches are caused in part by muscular knots in the head and neck that trigger pain. Neck stiffness also triggers headaches. Deep massage, gentle chiropractic adjustments, acupuncture, and stretching exercises interrupt the pain cycle and increase function. Rotator Cuff injuries, tendonitis, frozen shoulders, and bursitis all respond to hands on care. Physical agents including electric stimulation and ultrasound, deep tissue massage, acupuncture, stretching and strengthening exercises, and proper coaching all help resolve and heal the shoulder injuries and return the person to full activities. Tennis Elbow is a common sport’s injury often treated with steroid shots. The steroid shot weakens the tendon and increases the likelihood of re-injury. The elbow tendons have a very small blood supply and take time and careful rehabilitation to heal. Physical agents including electric stimulation and ultrasound, deep tissue massage, acupuncture, stretching and strengthening exercises, bracing and proper coaching all help resolve and heal the elbow injury and return the person to full activities. Carpel Tunnel Syndrome is responsive to hands on care. It is best to take care of this problem as soon as it appears, so it does not become chronic and difficult to treat. Fascial release, bracing, acupuncture, and proper body mechanics can help Carpel Tunnel Syndrome. Neck pain from postural and work related stressors, whiplash, arthritis, overuse injuries, pinched nerves, and damaged discs, is responsive to hands on care. Deep tissue massage, physical agents including ultrasound, heat and electric stim, gentle joint mobilizations and manipulations, acupuncture, posture exercises and body mechanics training help relieve neck pain and dysfunction. These methods interrupt the pain cycle, free the locked joints, and taut, stressed musculature, promote blood flow and allow your neck to function freely again. Upper back pain from postural and work related stressors, whiplash, arthritis, overuse injuries, pinched nerves, and damaged discs, all respond to hands on care. Deep tissue massage, physical agents including ultrasound, heat and electric stim, gentle joint mobilizations and manipulations, acupuncture, posture exercises and body mechanics training help relieve upper back pain and dysfunction. These methods interrupt the pain cycle, free the locked joints, and taut, stressed musculature, promote blood flow and allow your upper back to function freely again. Low back pain is caused by many factors, most of which can be understood and helped with our approach including deep massage, physical therapies, manipulation and acupuncture. Muscular strain, joint irritation, arthritis, disc injury and degeneration, irritated nerves, and locked sacroiliac joints all contribute to persistent and acute back pain. The goal of therapy is to reduce pain, promote function, stability and muscular balance of the spine. It is also our goal to help you understand and care for your back to prevent future injuries. When the nerve in the low back becomes irritated and inflamed, you will develop sciatica. This severe leg pain can make all positions, including walking, difficult. Sciatica can originate from the pressure of a disc on a nerve, the pressure on a nerve from arthritic changes in the spine and the pressure on the nerve from the spasm of the piriformis muscle in the hip and buttock area. The goal of our therapy is to decrease the inflammation of the nerve, release the muscular spasm and joint dysfunction, and restore pain free movement. Therapy may include physical agents, acupuncture, manipulation, and gentle exercises to balance the musculature in the hip girdle and low back. The hip is vulnerable to bursitis, arthritis, hip impingement and capsulitis resulting in pain in the groin, hip stiffness, and difficulty walking. Treatment includes acupuncture, deep tissue massage, mobilization and exercise prescriptions. This area is very responsive to hands on care. The knee is vulnerable to a range of injuries. Hands on care is helpful for inflamed tendons, inflamed bursae, strains and non-operatives knee injuries. Muscular balance and foot mechanics influence the knee, and their assessment helps with your recovery to full and painless function. The foot is vulnerable to numerous soft tissue injuries including plantar fasciitis, arch pain, heel pain, and great toe pain. Proper footwear and orthotics help support the foot. Hands on care including deep tissue work, physical agents, and acupuncture help release the tight damaged fascia and free the foot to heal from its pain and dysfunction. Exercise prescription helps correct contributing muscular imbalances.